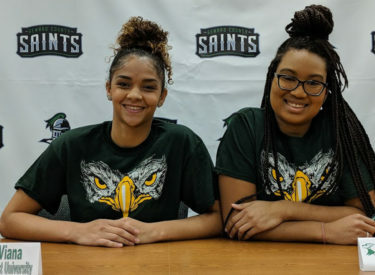 LIBERAL, Kan. – Two Seward County volleyball players signed their Letters of Intent to play for the Central Methodist University in Fayette, Missouri. All-Jayhawk selections Mariana Nascimento and Viviane Viana will be following former Lady Saints Assistant Coach Garrett Case to play for the Eagles. Nascimento’s name is written in the Seward County record books after two historic years with the Lady Saints. The two-time 1st Team All-Jayhawk West selection finished her career with the second highest hitting percentage in Lady Saints history, hitting .421 in her two seasons. A monster sophomore season helped her raise her hitting percentage, finishing the 2017 campaign hitting .449, the second best single-season hitting percentage in Seward County history. She finished fourth in the KJCCC in kills (345) and fifth in kills per set (2.90). Nascimento finished second on the team in points (425.5) while earning one Jayhawk Player of the Week along the way. Following a medical red-shirt season a year ago, Viana followed up her freshman Honorable Mention All-Jayhawk West season with a Second Team All-Jayhawk West selection. She opened up the 2017 season with a sensational performance recording 26 kills and 27 digs in the win over Odessa. The performance earned her the Jayhawk Player of the Week award. She lead the team with twelve double-doubles, including two 20 kill/20 digs outings. She finished fourth in the KJCCC in kills per set (2.95) and third on the team in points (384.0). The tandem will head to a Central Methodist team that went 24-12 a season ago, falling in the Heart of American Athletic Conference semifinals.